Download our media kit or browse the marketing opportunities below. To learn how you can begin marketing your business with The Chamber, contact Royce Brooks at Royce.Brooks@WoodlandsChamber.org or 281-363-8105.
Business Today is The Woodlands Area Chamber of Commerce’s monthly business publication designed to keep members up-to-date on Chamber events and services and member and community news, while also keeping members informed on legislative and business happenings. 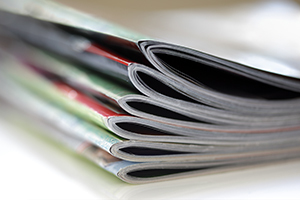 The magazine reaches thousands of the area’s top business executives, making it unmatched in its ability to deliver your advertising message to the people who make important decisions regarding your products and services. That competitive opportunity makes Business Today an affordable option for any size budget. 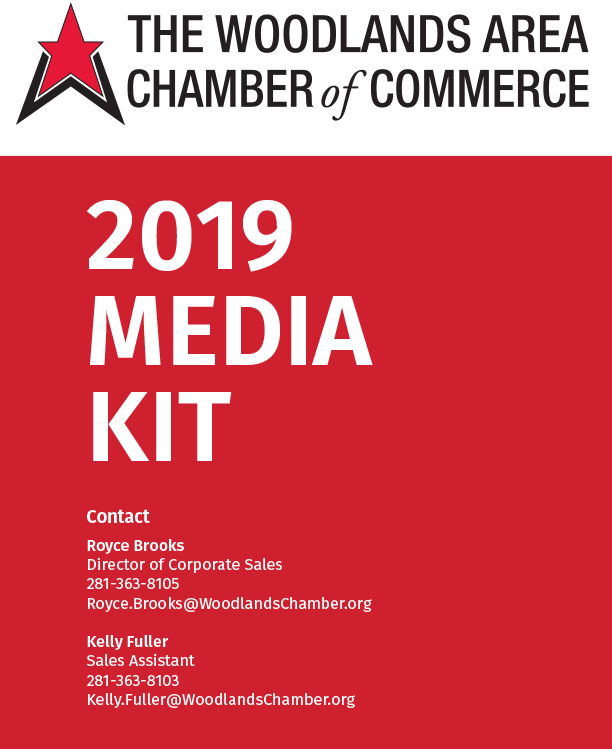 To secure advertising in an upcoming edition of Business Today, please contact Royce Brooks at Royce.Brooks@WoodlandsChamber.org or Kelly Fuller at Kelly.Fuller@WoodlandsChamber.org. Excellent choice for events, call for donations or volunteers and special promotions. Marketing our community is vital to attracting individuals and businesses interested in finding just the right place for their homes and offices. This comprehensive relocation tool reflects why our region is a great place to call home, as well as a great place to do business. A full year of exposure for your business, including two free listings. Great photography and articles that truly tell our story. An online version of the magazine complete with hyperlinked advertisements. A targeted distribution aimed at the decision-makers we (and you) want to reach. Diverse advertising rates so that all chamber members may participate. 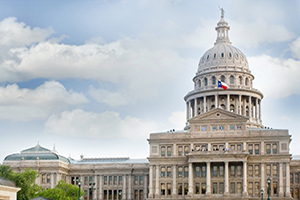 Multiple marketing options that enable all Chamber Members to participate. Wide distribution to area Newcomers. 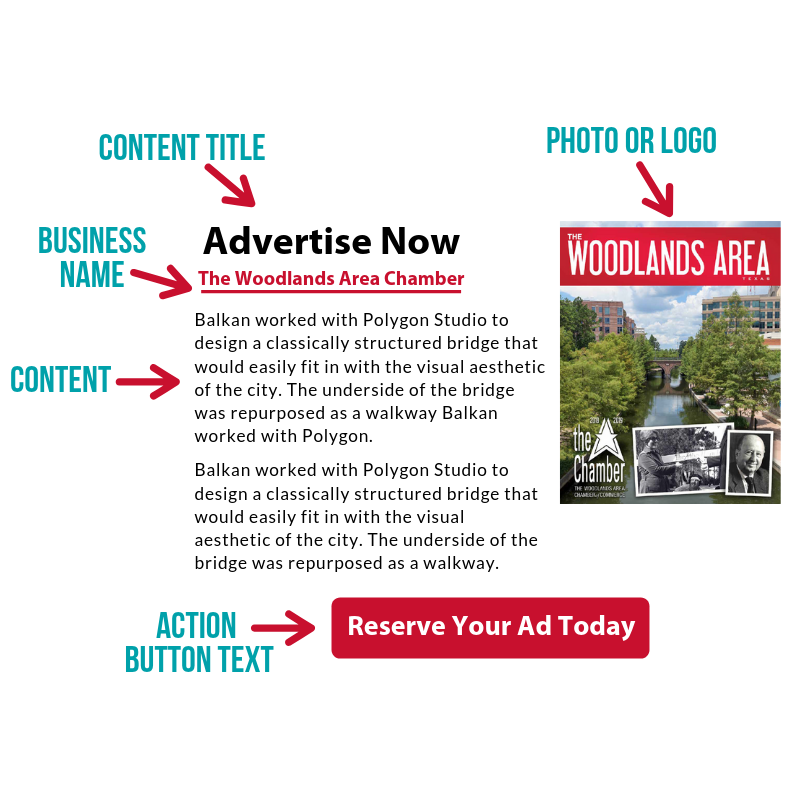 To secure an ad, contact Steve Anderson, the project sales manager from our publishing partner Town Square Publications, at 866-850-2818 or SAnderson@TSPubs.com. 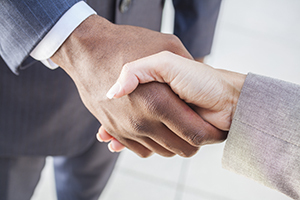 Take advantage of the following complimentary ways to market your business and make the most of your membership. Post Promotions on Hot Deals. Login to your Member Information Center and click Hot Deals on the lefthand side. This is a great space to add coupons or promotions that Chamber members and guests can view on WoodlandsChamber.org/HotDeals. 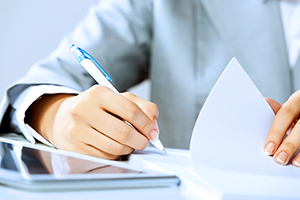 Submit a Business Brief. Submit a 50-word Business Brief to appear in Business Today magazine along with one JPEG photo. 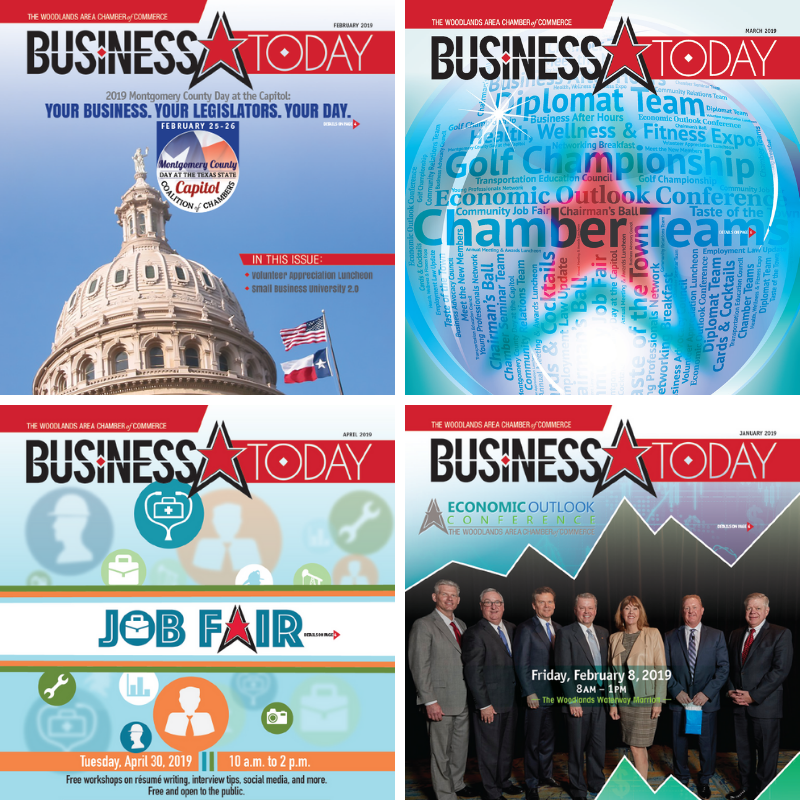 Please make submissions at WoodlandsChamber.org/Business-Brief. Due to the production schedule, briefs will skip a month from submission to publication. Example: Briefs submitted in June are considered for the August issue - please make note of this when submitting event information. Add Your Event to the Community Calendar. Login to your Member Information Center and click Events on the top of the page. 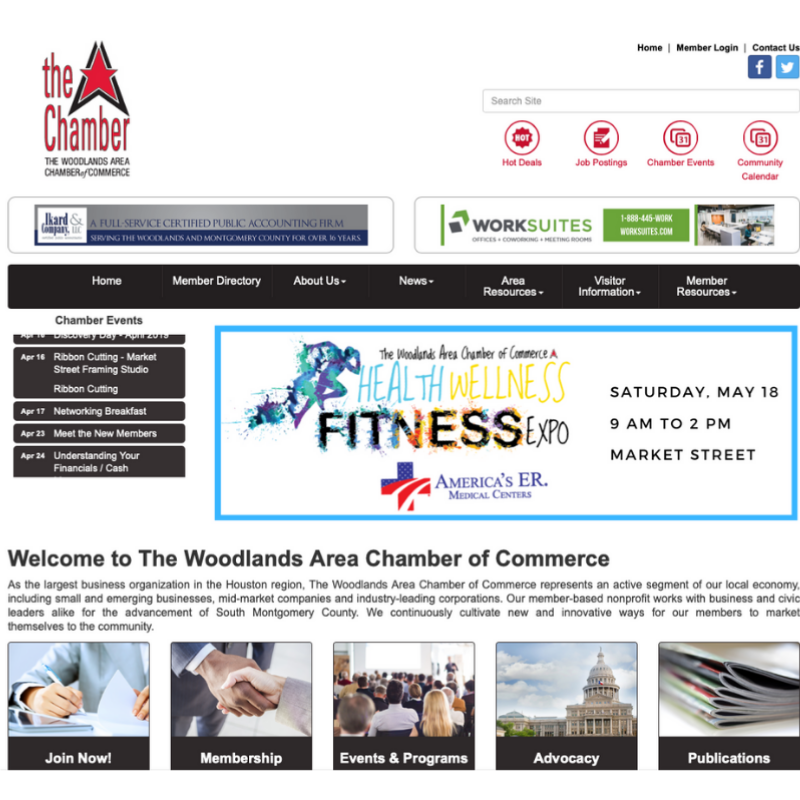 You can add photos, logos and more to your posting on the Community Calendar that Chamber members and guests can view on WoodlandsChamber.org/Events. Post Promotions on The Chamber’s Facebook Page. 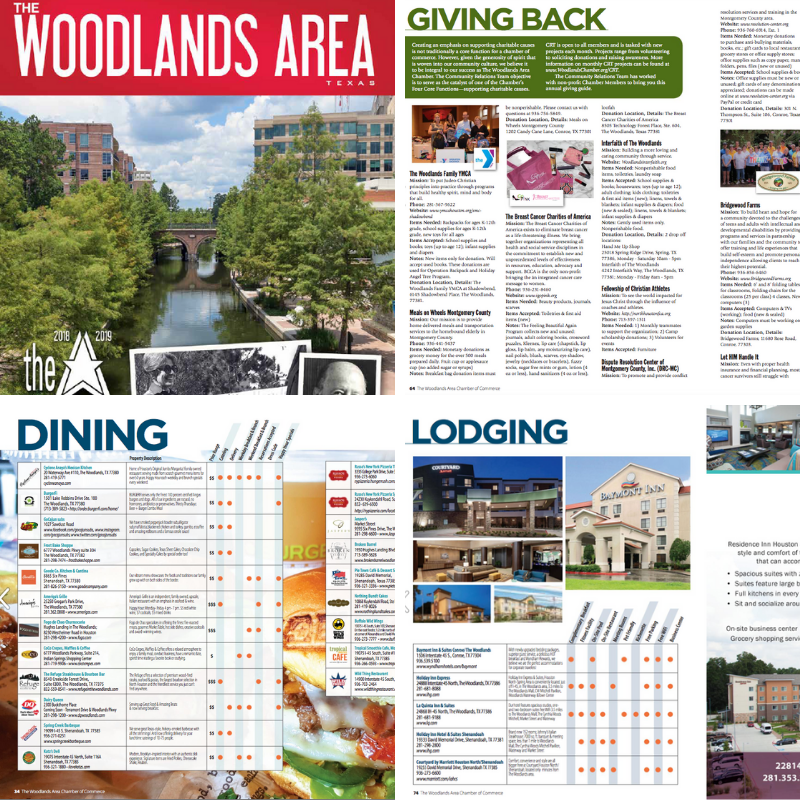 Like our Facebook page @TheWoodlandsAreaChamber and post your promotion, event or message. Bring Promotional Items for Discovery Day. The Chamber hosts Discovery Day Orientation for new Chamber Members every other month. You can include your promotional items in Discovery Day swag bags. Just drop off 50-60 items to The Chamber and we will include them in the next Discovery Day bags. Drop Off Bottled Water and Notepads for Use in the Conference Rooms. The Chamber hosts dozens of groups every week in our five conference and meeting rooms. You can donate branded bottles of water and notepads (5.5” x 8.5”) to build your brand awareness. 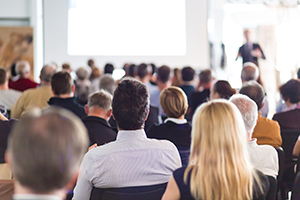 Bring Promotional Items to Business Connection Events. Bring your promotional items or brochures when you attend the monthly Business After Hours or Meet the New Members events. There will be a table available for you to display your items. Don’t forget to grab the leftovers before you leave! At Networking Breakfast you can arrive at 6:45 a.m. to stuff your items into the bags at each seat. Decorate a Table at Chairman’s Ball. You can sign up to be a Tabletop Decorator for Chairman’s Ball in August free of charge. It is a great way to showcase your business to another group of guests and compete for the coveted, “People’s Choice Award." More details can be found at WoodlandsChairmansBall.com. Bring FABULOUS Door Prizes to Business Connection Events. You can create some big fans by bringing door prizes to raffle off at any of our Business Connection Events: Business After Hours, Meet the New Members, Networking Breakfast or Young Professional Network. Drop them off at event check-in and don’t forget to attach your business card.